This unique Deluxe Audio Edition of the New York Times bestseller includes the unabridged audio book on three CDs; a highly designed, 24-page, 4-color booklet; and a fourth CD with a presentation in PowerPoint format that you can share with others on your team. 'Our nation and its institutions are crying out for leaders. John Maxwell... shows us the true path to leadership through the application of timeless principles supported by the bedrock of personal character.' - Edward C. Emma, President & CEO, Jockey International, Inc.
'An irrefutable must-read on leadership that is a simple and powerful list of guidelines to help build leadership in many areas.' - S. Truett Cathy, founder and chairman, Chick-fil-a, Inc.
'The ideas presented in The 21 Irrefutable Laws of Leadership are simple, clear, and easy to grasp- yet profound! It's an enjoyable, easy-to-read book that is educational yet entertaining. Whether you are a recent graduate just beginning your career, or a seasoned executive, this book is worth reading... and keeping at hand as a leadership reference guide.' - Amy DiGeso, CEO, Mary Kay Inc. The book is wonderfully written, the audio is also easy to listen to. The content is rich with theory, he ties each law into a particular scenario that he experienced. However, I felt it really lacked application. Introducing new and powerful theory is part one, giving guidance on application is part two. 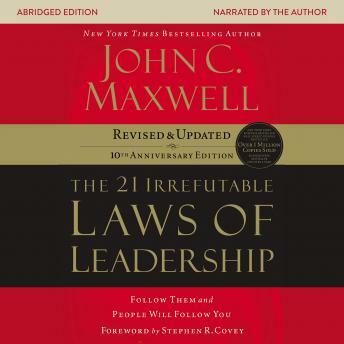 Maxwell does an excellent job of breaking down leadership principles into an understandable and applicable format. This book has so much in it that it is a must have for any person desiring to becoming a better leader. Maxwell always give you plenty to think about - this does the same! Very useful book that give indisputable advice in the rules and qualities to become a great leader in a world where there seem to less and less than in the past. Great read for current and future leaders. Love John Maxwell books! I loved this book! I can't wait to read more of John Maxwells books! He has a lot of knowledge! Great book straight to the points of leadership I highly recommend this book to anyone who wants to become a great leader. John C. Maxwell is such a knowledgeable business man! So far this is my 2nd book of his that I've read and I keep learning more and more!